Wow It's been a while since i've done a "new product" post! There has been so much slideware stuff being bounced around these days (COUGH *SDN COUGH COUGH) it's nice to see some honest to goodness, "solving a REAL problem, right NOW!" type products like new switches and new access points. 802.11AC Wave 2 is almost upon us, promising speeds of up to 6.8 Gigabit per second and a new method of allocating bandwidth so that CSCA (carrier Sense Collision Avoidance) algorithims traditionally used in the shared media of wireless can be avoided. While our existing 802.11AC Wave 1 access points can get away with a 1 gig connection (because although the physical radio rate is slightly higher, the actual data rate is less than 1 gig) with these access points obviously that is no longer going to be an option. I know what your thinking: "OK time to go and pull out all my Cat5E cable I guess then and replace it all, that will be super cost effective! Hey Boss! Know how we just got all that cabling put in when we moved into this office? Yeah it's redundant now we need to run all new cabling." The disruption to the office, the cost and the justification for the above scenario will be difficult for quite a few customers. NBase allows you to use Cat5E and Cat6 cable all the way to 100m (the original spec) with speeds of either 2.5gigabit per second or 5 gigabit per second! This is going to be a great stop-gap measure for a lot of people! The first switch we should look at is the great 3850. The 3850 has had Converged wireless access for a while now (which allows us to use it as both a switch and a wireless controller) as well as great stacking capabilities and bandwidth and Universal POE, allowing up to 60 watts of power per port! The new models of the 3850 introduce support for NBASE multi-gigabit. 12 of 24 ports on the 24 port model can accept NBase connections or 24 of 48 ports on the 48 port model. 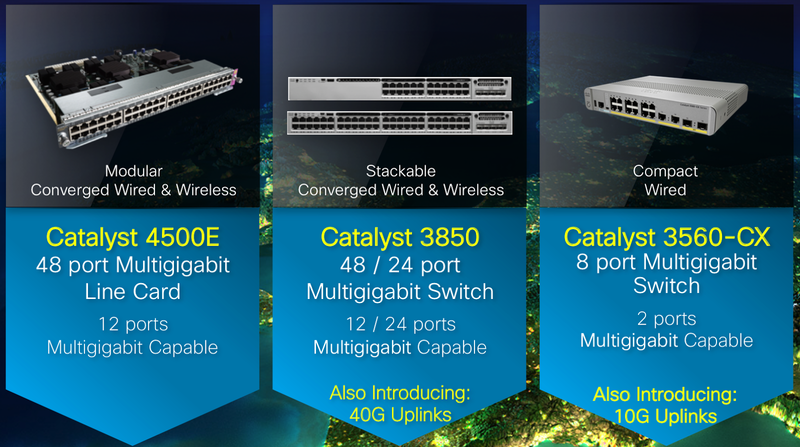 To support this potentially massive amount of bandwidth, the switch now supports 40 gig uplink modules! The 4500E chassis switch (which makes sense for a lot of people) hasn't been forgotten either with it's OWN 48 port linecard with 12 of the ports being multigigabit capable. It now also supports Converged Wired and Wireless like the 3850, so for those companies a little too big for a stack of 3850's but who want the converged wireless this is perfect! 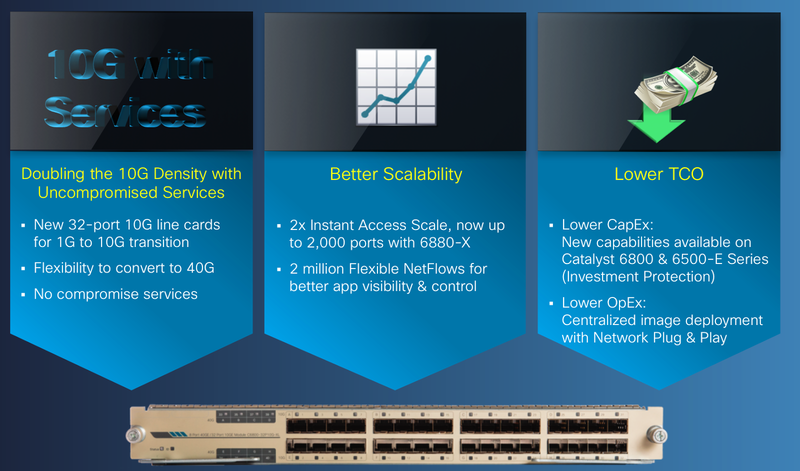 Before we go on to the 3560 let's talk about the new linecard for the 6500/6800 and the other improvements introduced for this platform. As you can see it offers 32 x 10 gig ports! Double the amount previously offered. an odd ommision in this announcement is any mention of any linecards that are going to support NBase for the actual 6500/6800 itself! Which I find a bit strange. 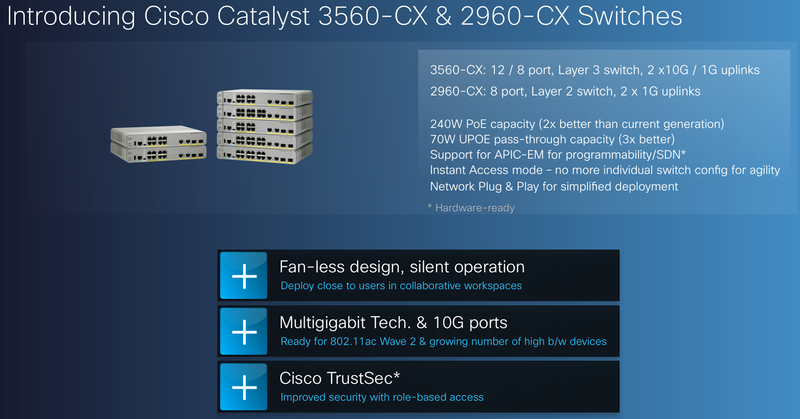 Like the 3850X these models support NBase technology, Universal POE and in certain models 10 gigabit uplinks, all in a completely silent and fanless switch! What's more, the new models can be used as instant access switches, allowing you to centralize the configuration on your 6800 switches. Depending on what your network topology looks like, this could be a huge boon! I hope you found this interesting and are as excited as I am to see if the products live up to the hype! An error occurred while retrieving settings. To try again, refresh the page." - Don't underestimate the HTTPS aspect, the cert's being non trusted is quite a pain for the users, although once they trust them in their browser they are fine, anyone else logging into the PC will get an invalid cert. Cisco has a few methods to resolve this like having your own CA and using properly signed certificates. and other various timeout issues!